Back & side : African wenge. A perfectly quarter cut set with straight grain. Top : Italian spruce. With modified 5 fan brace construction. 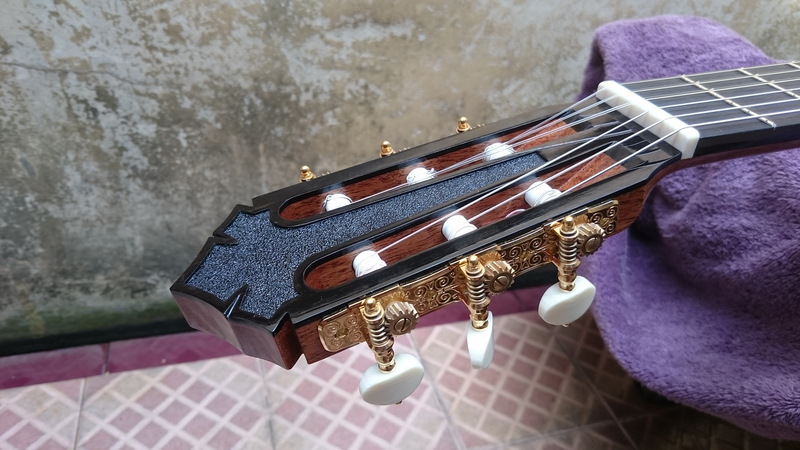 Tuning machine : Gotoh premium. Scale : 650mm. 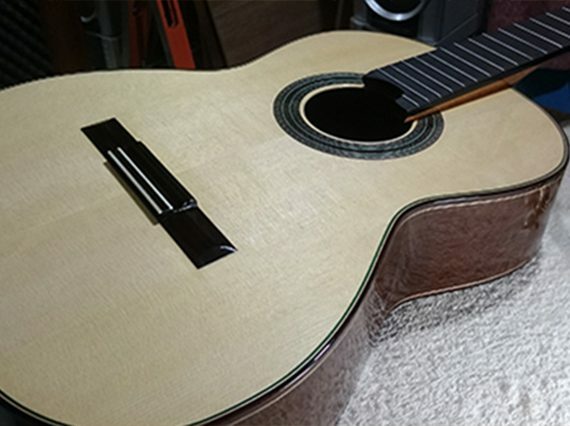 20 fret on an ebony fingerboard. 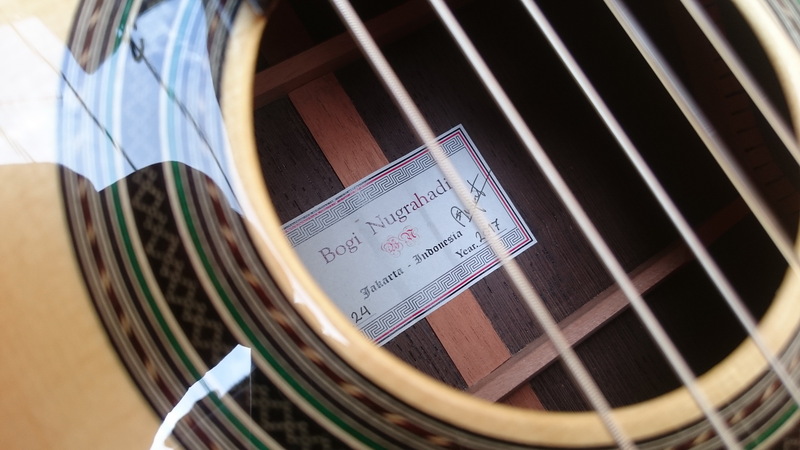 Bogi is the one and only Indonesian luthier that i exclusively represent in my shop. 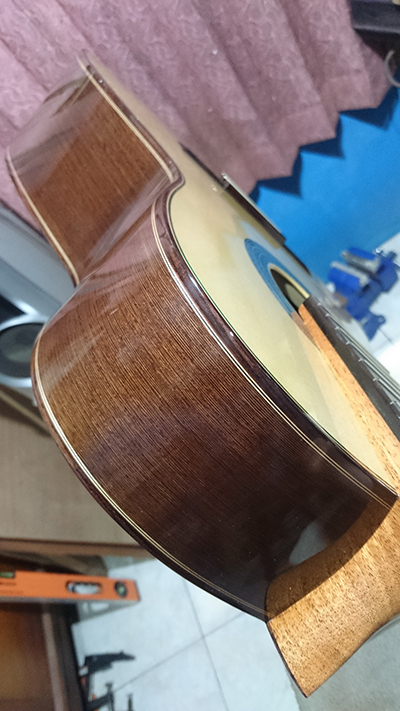 His build quality shows a much higher standard than any other maker in Indonesia. He makes every single part completely by hand (incl. the rosette, lining, purfling, etc). 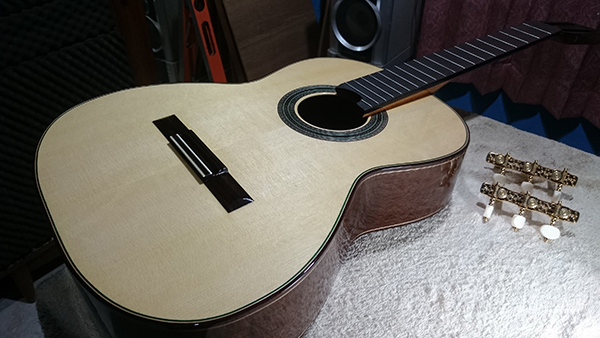 Using only high quality natural material, he polish the entire guitar with traditional method French polish of shellac finish. 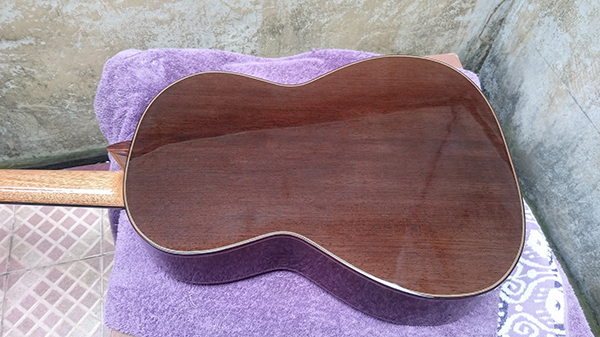 His french polish quality is also superb, very clean and perfect. 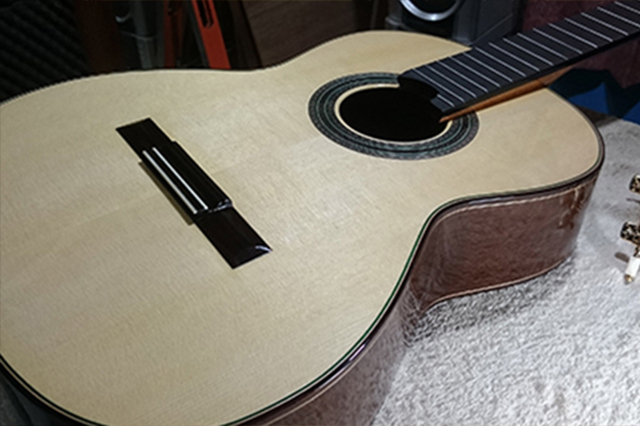 His guitars has evolved from smaller Hauser / Torres inspired fan brace construction, to a slightly modern construction with all wood cross lattice brace and elevated fingerboard. Obtaining significantly much more powerful modern sound, but still with traditional sound character. 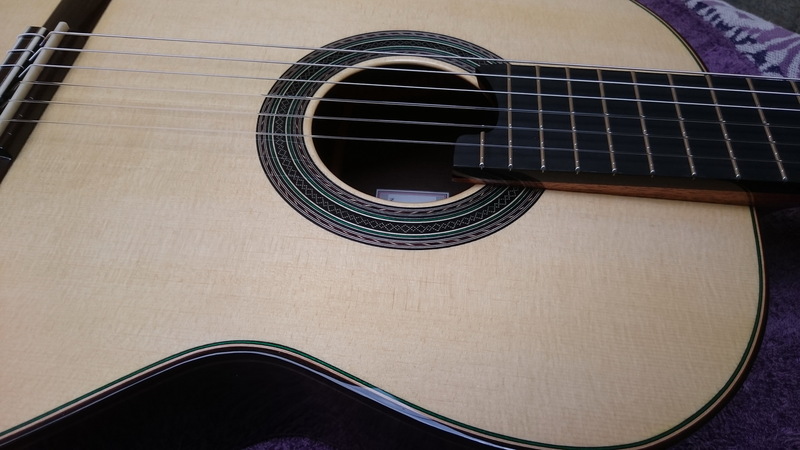 Years after examining his lattice system, he creates an entirely new bracing system – a modified traditional 5 fan brace system with large X brace below the soundhole and the closing bar. This new system allows his to achieve a great power & sustain with traditional tonality. 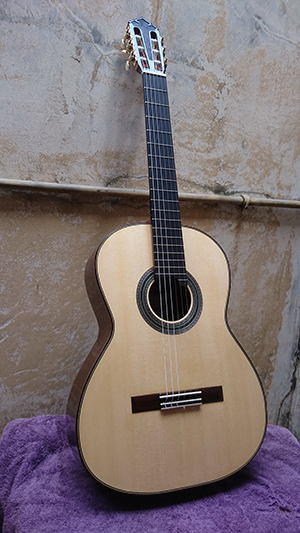 Bogi’s guitar has much more impressive sound performance (power, sustain, balance, and range of tone color) than so many much more expensive US / Spanish / German instruments. 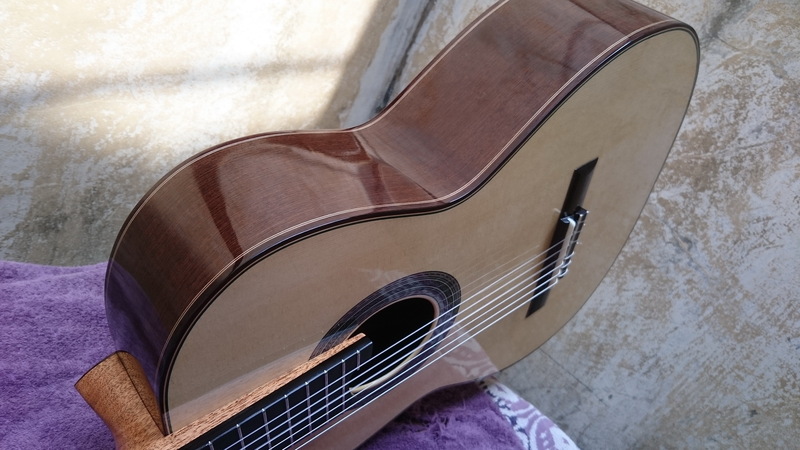 This one has body resonance near G, it has very natural traditional sound character like spanish Granada style guitar, but with stronger and powerful sound. Like all his recent guitar, the most remarkable thing is the extremely wide range of color that (once again) i found very similar to Granada style guitar. You can manipulate the sound with the slightest movement of right hand and nail angle. Overall, this is strikingly beautiful, expertly constructed, tastefully decorated amd finished, with sound quality on the very high standard.